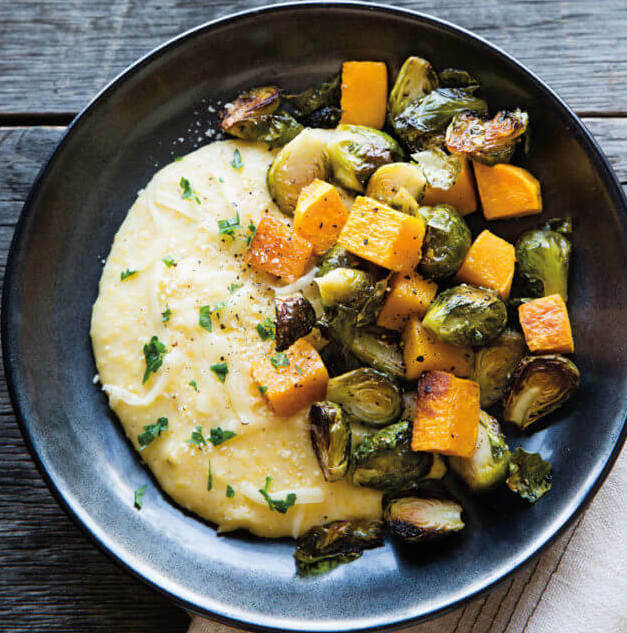 A warm bowl of creamy polenta is about as comforting as it gets, which makes it a great foundation for a perfect fall meal. In a large pot over high heat, bring 5 cups (40 fl. oz) of water and 1/2 tsp salt to a boil. Stir in the polenta and bring to a boil. Reduce the heat to low and cook, stirring often, until the polenta is soft and smooth, about 40 minutes. Meanwhile, pile the squash, brussels sprouts and onion into a baking dish. Drizzle with the olive oil and balsamic vinegar, season with salt and pepper, and toss to coat. Spread the vegetables into a single layer and roast, stirring once about halfway through, until fork-tender and golden brown, 20-25 minutes. Remove from oven and set aside. Once the polenta is soft, stir in the butter and Parmesan until melted. Season to taste with salt and pepper. Spoon the polenta into bowls, top with the roasted vegetables and garnish with parsley. Serve immediately.